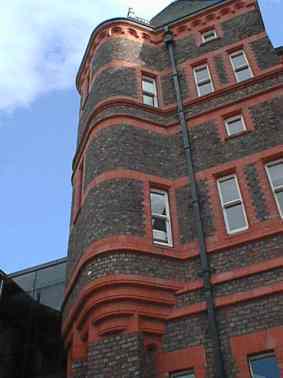 The Liverpool Royal Infirmary was designed by Alfred Waterhouse (b. July 19, 1830, Liverpool, Eng.d. Aug. 22, 1905, Yattendon, Berkshire). This aerial photograph from the 1930s shows the proximity of the Royal to the University (on the right of the photo). The building was built in the nineteenth century with the foundation stone being laid by the Earl of Derby on the 28th October 1887. The building took two years to complete. The Neo-Romanesque and Gothic detailing of its exterior was complemented by the Infirmary's innovative organisation and utility. Waterhouse had taken care to consult his clients and take the best views of the day into account. Florence Nightingale was extensively consulted and advised on the buildings fenestation and the need for ventilation. There was an innovative heating system using steam pipes and radiators and a modern air circulation system. The design was sensitive to the risks of fire, with the floors having concrete rather than wooden bases. The walls were tiled with glazed coloured brick, allowing for creative designs, which echoed the great Romanesque church interiors of southern France. The overall effect was one of both aesthetic and hygienic attraction, which reaches a visual climax in the hospital chapel, which formed a centrepiece of this Victorian institutional structure, and commented upon the contemporary pre-occupation with the well being of the spirit as well as the body. 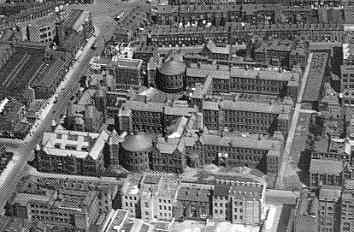 Waterhouse also planned for the future and the foundations and walls of portions of the building were sufficently reinforced to wthstand expansion upwards should additional wards and operating theatres be required. When the Infirmary closed its doors on the 17th December 1978, a special period in the history of hospital care in Liverpool ended. For 89 years it had served the community and witnessed many important changes in medical and nursing techniques. Although the Royal Liverpool University Hospital was built between 1966 and 1978 on a site opposite the Infirmary. The last patients only left the `Old Royal' on the 17th December 1978 and the building then lay dormant for 16 years. The University of Liverpool took over the building and began turning it into teaching space for the New Curriculum of the medical school, adapting ward sin to sklills laboratoris and such like. Photos below show the building exterior in 2000. Manchster's Gothic Law Courts (1859). Liverpool Lime Street Station Hotel (1868-71). London -Natural History Museum (1873-81). Owens College (1870-98; now Victoria University of Manchester). Pembroke College (1871), Cambridge. Dr Barton Hall established the University Department of Psychological Medicine, later re-named the University Department of Psychiatry. He was its Director and first head of department. He had been teacching undergraduate and postgraduate students for many years at the Liverpool Royal Infirmary. The new Department enabled the expansion into research as well as teaching. By the time of his retirement in Autumn 1964 Barton Hall's Medical Psychology course for underraduates was the most extensive course in the country. 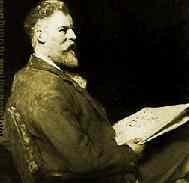 In 1924 Dr Barton Hall headed the new psychotherapeutic clinic which evetually became known as the Liverpool Psychiatric Clinic. 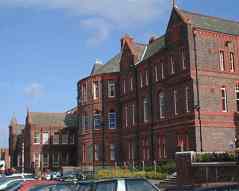 At the formation of the NHS in 1948 the clinic was taken over by the Liverpool Regional Board and it moved to new premises in Croxteth Road and eventually became the first psychiatric day hospital in the region. Dr Barton Hall was succeeded by Professor Frank Fish, who moved to Liverpool from Edinburgh University. Wilkinson, C. (1999) Liverpool from the Air. Liverpool, The Bluecoat Press. All pages copyright �Priory Lodge Education Ltd 1994-2004.